But there has been no published report of glove perforation occurring during liposuction till date. Hence, we report two cases of glove perforation occurring during liposuction for gynecomastia, with probable mechanism of injury and possible methods of prevention. A 29-year-old male with bilateral gynecomastia was treated with liposuction and surgical excision of the gland. Liposuction was done using the tumescent technique with a 3 mm cannula. As the liposuction proceeded toward the subareolar/subglandular area, there was accidental glove puncture on the left index finger (nondominant hand) [Figure 1]a and b. A 25-year-old male with gynecomastia was treated with liposuction and surgical excision of the gland. In this case, we modified the technique of liposuction to stabilize the liposuction cannula with the left hand [Figure 2]a to avoid glove injury to the left index finger. This time, liposuction of the subareolar area caused injury to the thenar aspect of the left (nondominant) hand [Figure 2]b. The mechanism of glove puncture during liposuction seems different and is instrument and technique-related. 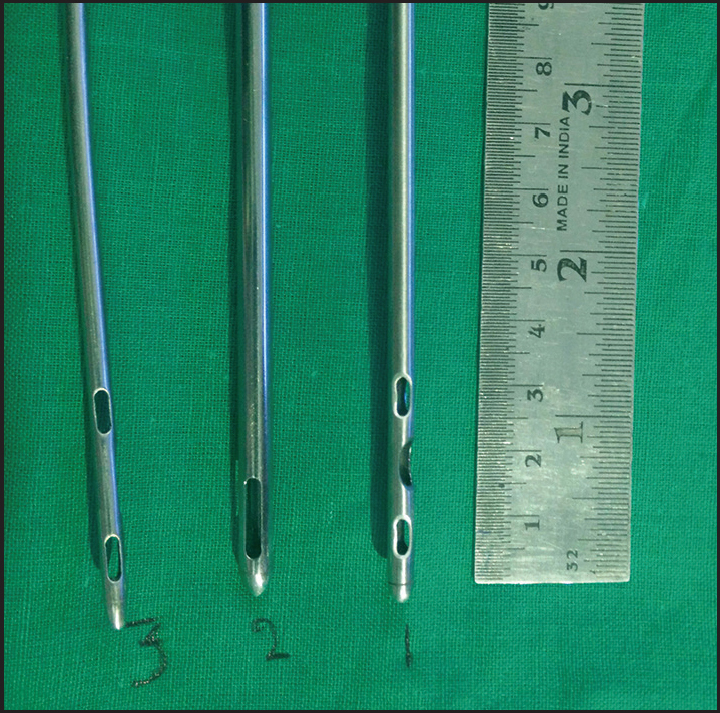 In suction-assisted liposuction (SAL) blunt-tipped hollow cannula of various designs with variations in size and location of the holes are used [Figure 3]. Liposuction for gynecomastia is performed by placing the nondominant hand over the breast tissue to guide the cannula, while the cannula is held in the dominant hand and moved in a forward and backward motion. As the liposuction proceeds close to the incision site, the holes in the cannula are likely to come in close proximity to the surface of the glove over the index finger of the supporting left hand and the negative suction pressure is likely to act on the surface of the glove causing accidental puncture in the glove. Another likely mechanism contributing to the glove puncture is the thermal injury caused by the friction developed between the gloved finger and the cannula during continuous to-and-fro movements. Both these mechanisms are likely to act independently or in combination to cause a glove perforation. We recommend a change in the design of the standard liposuction cannula, wherein a single hole closer to the tip of the cannula would prevent the glove coming in contact with the negative pressure of the cannula. This cannula can be selectively used during subareolar liposuction in gynecomastia and liposuction around the incision site in other cases. Anterior axillary incision for liposuction of subglandular liposuction would prevent accidental exit of the holes in the cannula and, hence, avoid glove puncture. Ersozlu S, Sahin O, Ozgur AF, Akkaya T, Tuncay C. Glove punctures in major and minor orthopaedic surgery with double gloving. Acta Orthop Belg 2007;73:760-4. Barbosa MV, Nahas FX, Ferreira LM, Farah AB, Ayaviri NA, Bariani RL. Risk of glove perforation in minor and major plastic surgery procedures. Aesthetic Plast Surg 2003;27:481-4. Partecke LI, Goerdt AM, Langner I, Jaeger B, Assadian O, Heidecke CD, et al. Incidence of microperforation for surgical gloves depends on duration of wear. Infect Control Hosp Epidemiol 2009;30:409-14. Cole RP, Gault DT. Glove perforation during plastic surgery. Br J Plast Surg 1989;42:481-3. Marín-Bertolín S, González-Martínez R, Giménez CN, Marquina Vila P, Amorrortu-Velayos J. Does double gloving protect surgical staff from skin contamination during plastic surgery? Plast Reconstr Surg 1997;99:956-60.